There is a new home for cross-disciplinary research at the interface between plant biology, mathematics and computer science: in silico Plants (isP). 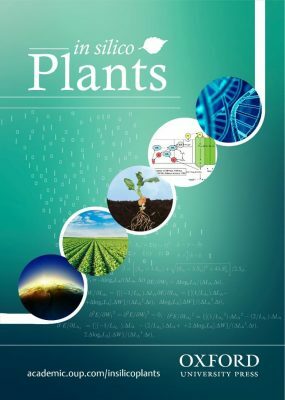 Mathematical modelling and computational analysis of plants and plant-related processes is growing rapidly. Web of Science lists 4881 publications in the last ten years on mathematical models, which cover just Arabidopsis and four crops, and half of these articles emerged within the last two years. This represents a point of transition as plant biology becomes increasingly quantitative, and theoretical predictions increasingly precede and guide experimental discovery and proof-of-concept. Our community now needs a point of focus to bring it to the attention of policy makers, funding agencies, colleagues and educators. isP, with your help will do this. As a not-for-profit journal it will support our continued integration and annual meetings to advance our cause in an area that promises to revolutionize plant sciences. isP will lead to rapid advances in plant modelling. Readers will have access to research across disciplinary boundaries – mathematical and conceptual modelling, systems analysis, computer simulations, and visualization. Access to diverse publications in one place will enable a cross-fertilization of ideas and access to new tools, approaches, and solutions to challenges. isP’s founding editors exemplify its cross-disciplinary outlook on computational plant science. Graeme Hammer (Univ. Queensland) – models of crop growth, development and yield that enable simulation of consequences of genetic and management manipulation of crops in specific target environments, and under climate change. Przemyslaw Prusinkiewicz (Univ. Calgary) – modeling, simulation and visualization of the development of organs, plants and communities. Xin-Guang Zhu (Chinese Academy of Sciences, Shanghai) – multi-scale dynamic systems models and tools to support identification of new breeding or engineering targets to gain higher sustainable crop productivity. isP is an OpenAccess journal launched via Oxford University Press (OUP) and Annals of Botany (AoB). Rachel has served as lead manager of both Global Change Biology and GCB Bioenergy for over ten years and has been instrumental in the success of both journals. Rachel has overseen the development of GCBB as a fully open access online journal and the social media that has been a major part of promotion of both journals. Rachel has also served as coordinator of the Crops in silico project and organization.